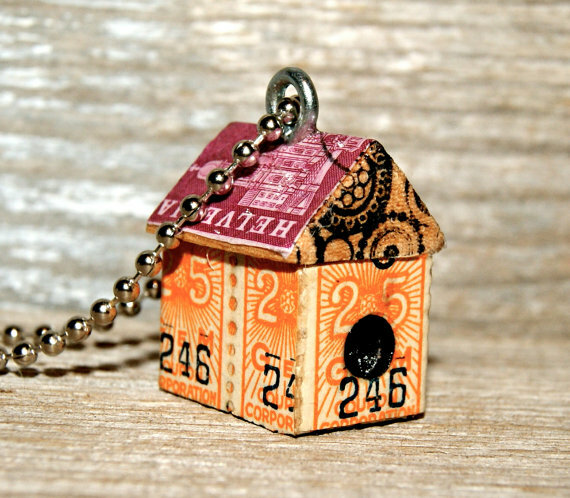 I've featured little house pendant jewelry before. But a birdhouse? No. So this is a first! 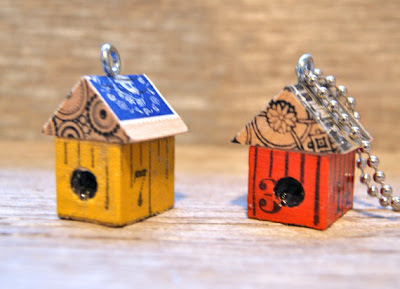 Heather Alexander is the artisan behind these delightful art birdhouse pendants on HA! Designs on Etsy. The mixed media creations really do highlight her artistic abilities as she takes what really are just wooden pieces and collages them into sweet designs. She also recycles a great deal - the birdhouses above utilize not just vintage tape but genuine vintage stamps saved from an old letter! 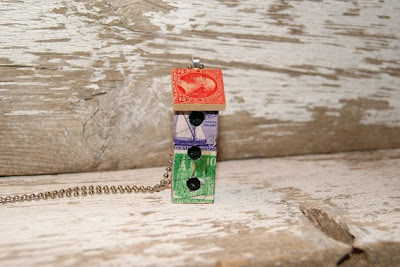 Heather's creative mind veers towards the fun and funky for sure as shown with her birdhouse condo/triplex pendant! 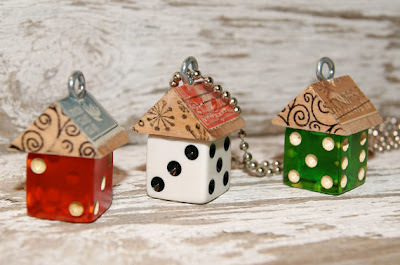 She also upcycles dice for her birdhouse pendants. If you really aren't into basic woodworking but would like to make your own, you can buy her kits. Heather also makes wonderful watch crystal pendants and all kinds of altered upcycled jewelry. These looked so familiar... then I read her intro at her store... it's because I saw them on the cover of the 2011 Handcrafted Jewelry magazine. Those little birdhouses are so cool! The little birdhouses are so adorable. I love how she added the vintage stamps, and tape in her designs. They are so cute.